Let us say that at 0 ms init() function starts executing and during the execution of init() function, a mouse click event occurs at 5ms. Now, as the main thread is already executing the init() function and is capable of executing just a single block of code at a time, it queues up handleMouseClick() function next in the execution queue. At 10 ms init() function sets a timer which will execute every 10 ms. Fist execution of the timer task is scheduled at 20 ms, second at 30 ms and so on. The execution of init() function takes 15 ms and after its completion, handleMouseClick() being next in the queue starts executing i.e. starts executing at 15ms. Execution of handleMouseClick() function takes 8 ms i.e. it completes at 23 ms and as timerTask() function was scheduled to run at 20ms, timerTask() function gets queued up in execution queue and is executed after the handleMouseClick() completes. Since there is no other function present in the execution queue that need to be run, timerTask() function runs at its scheduled time i.e. 30 ms , 40 ms and so on. 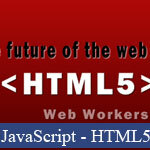 Web Workers allows you to load your script dynamically and run it in background thread. Creating a worker is simple. All you have to do is, call the constructor and pass the URI of the script you want to execute as an argument. Workers are relatively heavy weight and are not intended to be used in large number. Workers don't have access to the DOM i.e. you don't have direct access to the 'parent' page. However, Web Workers API do provide you with methods like "onmessage" and "postmessage" which let you communicate with the main thread. onmessage : method used for receiving messages sent from the worker, also can be used in worker for receiving messages sent from main thread. postmessage : method used for sending messages from worker to the main thread, also can be used in main thread for sending messages to worker. Here is the main script that created a new worker. In worker's onmessage event handler, we log all the messages received from the worker, i.e. this event handler is called when postmessage() function is called from the worker. This script also sets a timer, which calls the sendMsgToWorker() function every 5 sec. Lets have a look at "worker.js" script. In this example, the main thread starts a new thread and instantiates a timer which calls sendMsgToWorker() function every 5 seconds. sendMsgToWorker() function sends a message i.e. "Sent Message From main" to worker by calling postmessage function on worker object. The worker receives this message in the onmessage callback function(in "worker.js" script) which prefixes the message with "In worker on message method :" and sends it back to the main thread using postMessage() function of worker API. Also, worker thread instantiates a timer which calls sendMsgToMain() function every 5 seconds. sendMsgToMain() sends a message i.e. "Sent Message From worker" to the main thread using postmessage() function. Messages sent by calling postmessage in 'worker.js' are received by worker.onmessage callback function(in main script) and are then logged to the console. So, now there are two threads that run forever. First one is the main thread that receives messages sent from worker and logs them to the console and also sends a message every 5 seconds to the worker. Second thread, is the worker thread which sends the received messages from the main thread, back to the main thread and also sends a message every 5 seconds.